Show your Mallo Cup pride with some Boyer Candy Company logo merchandise! From hoodies to t-shirts, we have the perfect selection of Boyer swag to show people how much you love Boyer Candy. Mallo Cups are a nostalgic favorite, and much like these t-shirts, never go out of style. 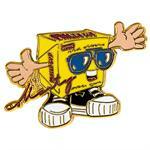 Have you been saving up your Mallo Cup points? We still happily accept Boyer Play Money in exchange from some great Boyer Candy Company products. From Nostalgic candy tins and stadium blankets to Mallo Cup baseball caps, we have everything you need to show the world that you’re on Team Mallo Cup. Our Marty Mallo, Patty Peanut Butter, and Sam Smoothie plush dolls are the perfect gift for children and collectors alike. Whether a nostalgic Mallo Cup fan or a newly blossoming Boyer Candy fan, shop Boyer Candy logo merchandise at BoyerCandies.com today! Don’t forget to stock up on some delicious Boyer Candy Treats before you check out! 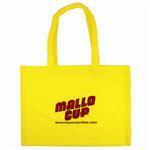 Mallo Cup yellow tote bag. 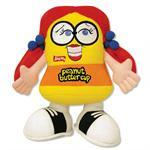 Patty Peanut Butter Doll - 7.5"
Patty Peanut Butter stuffed toy - Great for kids!